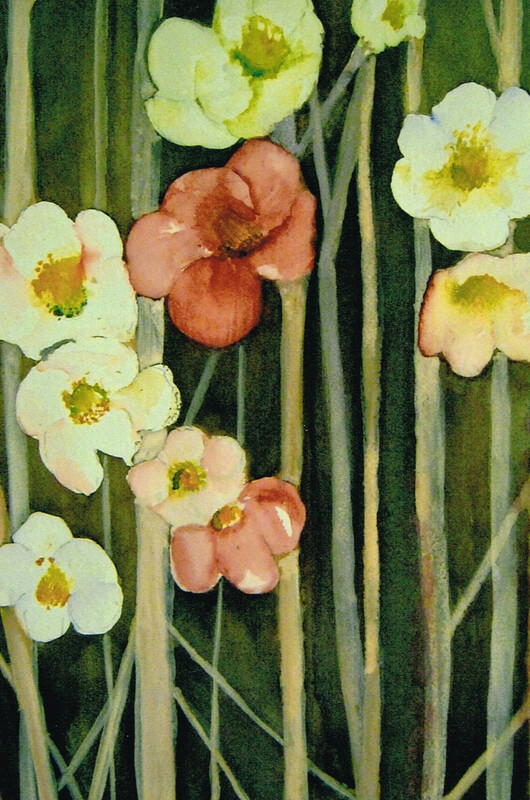 This is a beautiful watercolour painting by Margaret of flower and stems in a dark background. The Australian Jabiru is similar and sometime confused with the subsaharan Africa “Jabiru”. The Australian bird is called the ‘Asian Black-necked Stork (ephippiorhynchus asiaticus) while the African Jabiru, while similar is called the Saddle-billed Stork (ephippiorhynchus senegalensis). A town in the Northern Territory of Australia is named after this bird and is surrounded by the famous Kakadu National park. This town was originally the base town for the nearby ERA Ranger uranian mine. The ore body for the mine was discovered in 1969. The mining of uranium has been very controversial in Australian politics for many years, particularly in the 1970’s. The Jabiru bird is found in the area. 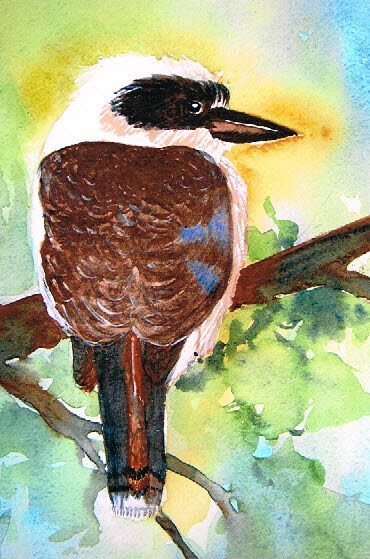 This painting is entitled, “Sunrise Silhouette from top end – Jabiru”. 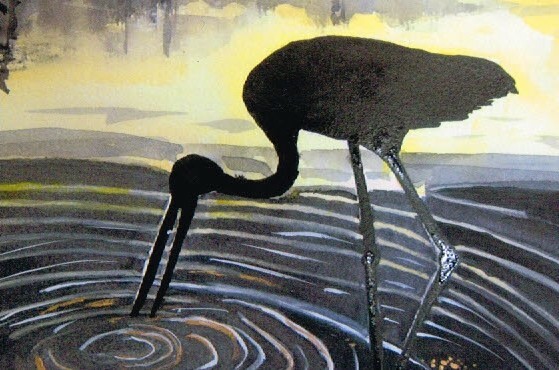 It is a depiction of this wading bird on a pool feeding. It is fascinating how Margaret has shown the ripples in the water as though the bird has been standing waiting for movement under the water. It has just struck, but unfortunately for the bird, breakfast is not available yet. It is a magical painting depicting the early morning as the first light of the day shines in the sky signifying a new day. 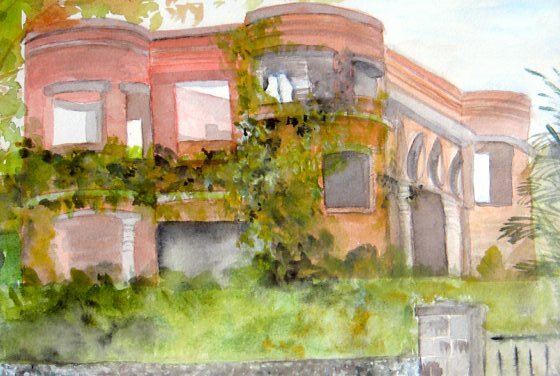 Margaret O’Toole has exhibited some of here watercolour work recently. 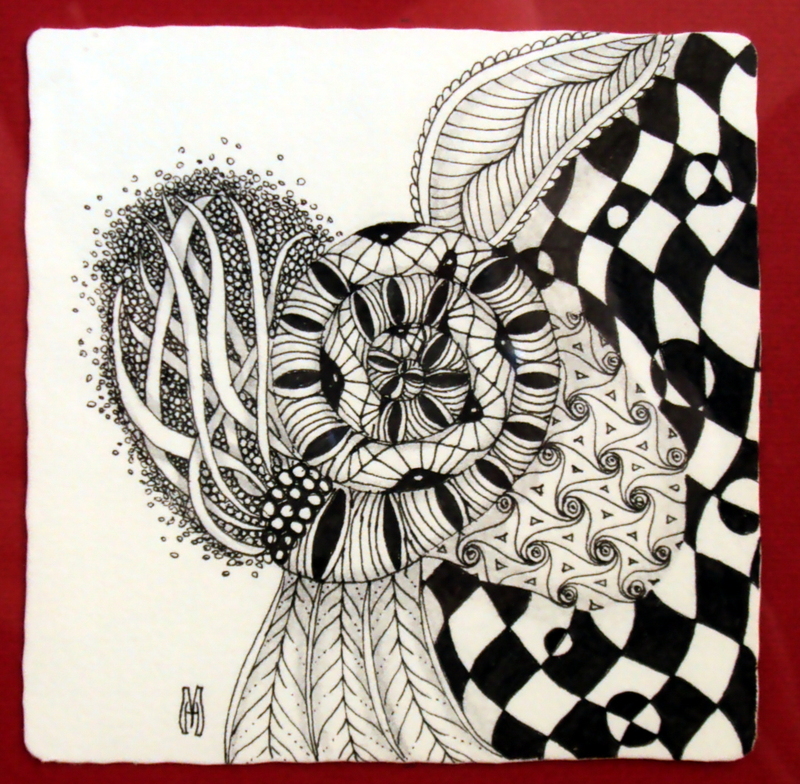 Following are some of her work that were exhibited at the Noah Head exhibition. Margaret is a faithful contributor to this web page and vice president of the Habitat Association. 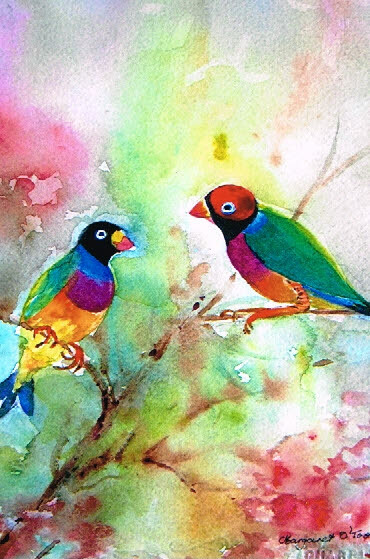 Margaret has painted in water-colour one man’s dream not realised. This is a photograph of the building, derelict, deserted and rejected by the building surveyors at the local council. The story goes, that a young doctor wanted to build a house overlooking a beautiful lake. The plan was that house was to be perched on a high point overlooking the lake. So he purchased this land. Over the years and with every spare moment, he would plan, and every weekend and holiday time bring building materials to the site. This was at a time before any other houses were in the area and the story goes that he would bring these materials by wheel barrow from one of the local railway stations. The thing is he chose to take the materials from Tuggerah station instead of the closer Wyong station. We can only speculate how he got the materials to the house. There used to be a small fairy running the lakes many years ago and it used to take passengers from a small jetty on the lake about 1 kilometer from the Tuggerah station to the The Entrance, a rather original name for a town perched on the eastern and seaward side of the lakes near the entrance in the lakes to the sea. We can only assume that this intrepid doctor would trundle the material to the jetty in his wheel barrow and hire the fairy boat to take these material up the large Tuggerah Lake to a smaller lake to the north, Budgewoi Lake, being the middle lake of the three lake system. Once there the doctor would need to carry, several bricks at a time or bags of cement up the steep hill to the site of the house. Year after year he must have worked to build this brick and concrete edifice. But the story gets very sad. The dream house was for him to share with his wife, but she died, leaving him an elderly man with a half-finished house. No-one is sure whether he is still alive in 2013 or whether there is an heir to the property. It just lays derelict. In recent years as the remote location has become a regular suburb or locality on the shores of the lake, school children have started to play on the site, so the local council has, in the interest of safety, erected potable fencing around the site, with an order that the house can never be completed because council standards have not been followed even though these standards were formulated years after the house was started. 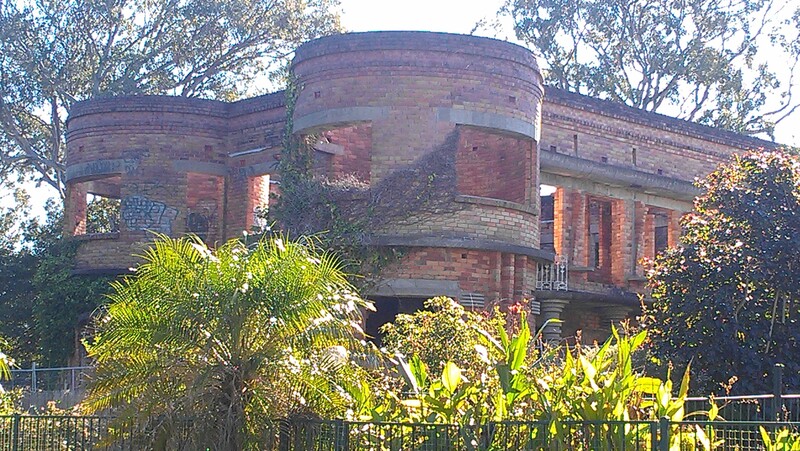 The end result will be that if the property is ever to be developed this peace of the Central Coasts of New South Wales’ history will be pulled down and lost forever.